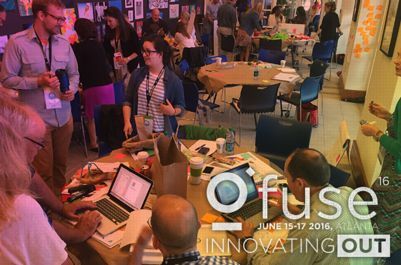 FUSE 2016 conference: Design Thinking Experience, June 15-17, Atlanta, GA. Led by the Mount Vernon Institute for Innovation. TD4ED - uses design thinking practices to help teachers identify problems, define challenges, and develop actionable solutions  together. Available as a free stand alone self-facilitated interactive multimedia design thinking journey for teachers or as an onsite in-person PD offering. From the Business Innovation Factory. MakeSchools Higher Education Alliance: State of Making Report, June 2015. Explore 40 Higher Education Institutions. Gary Stager's Invent to Learn Maker Lab shopping list for elementary schools. Spreadsheet-PDF. Spreadsheet-Excel. edutopia's Maker Education Resources Page: Includes Project-Based Learning Through a Maker's Lens, By Patrick Waters, July 9, 2014; Designing a School Makerspace, by Jennifer Cooper, September 30, 2013; The DIY World of Maker Tools and Their Uses, by Vicki Davis, July 21, 2014; 6 Strategies for Funding a Makerspace, by Paloma Garcia-Lopez, September 5, 2013; and a terrific new video, How the Maker Movement Connects Students to Engineering and Tech (July 22, 2014). Project Ideas, Videos, and Other "Making" Resources. From the June 2014 ASCD Education Update feature, "If You Build It: Tinkering With the Maker Mind-Set," June, 2014. Making Their Way: Creating a New Generation of Thinkerers, by Elliot Washor and Charles Mojkowski, report on a symposium that took place at the 2010 Maker Faire, Dearborn, MI. Designing a School Makerspace, by Jennifer Cooper, Edutopia, September 30, 2013. Blog post includes list of excellent resources. Teaching Science in the 21st Century Blog by Lindsey Own. Also, Lindsey Own on Twitter, @LindseyOwn. makeX: Teen Mobile Makerspace, Palo Alto, CA. Project Goal: To design and develop a third space for Palo Alto middle-school and high-school age teens that is a space of their own that promotes self-directed and mentored creative expression and learning about art and technology, meets the educational and social needs of the teen audience and through its mobile nature, encourages participation by teen audiences throughout the City. Making Thinking Happen blog space from Agency by Design at Project Zero, Harvard, exploring ideas at the intersection of the maker movement, design thinking, and Project Zero frameworks. Instagram. Twitter. Tony Wagner, Creating Innovators: The Making of Young People Who Will Change The World, Scribner, 2012. Order at Amazon or Barnes & Noble. Invent To Learn: Making, Tinkering, and Engineering in the Classroom, By Sylvia Libow Martinez & Gary Stager. Buy at Amazon. by David Thornburg, Norma Thornburg , Sara Armstrong. Foreword by Gary S. Stager. Design, Make, Play: Growing the Next Generation of STEM Innovators, edited by Margaret Honey, David E. Kanter. Buy at Amazon. Includes chapters by Dale Dougherty, Elliot Washor and Charles Mojkowski, Steve Zipkes, and Mitch Resnick.